Charlie Trotter is a world-renowned chef with a reputation for excellence. He kindly agreed to share a few thoughts with TableFare on cooking with grains of paradise. "Grains of paradise is in the cardamom family and has a very pronounced floral quality. This is a wonderful spice to add at the last second to a preparation that has a warm or hot temperature. The aroma is stunning with nuances of orchid, green cardamom, grapefruit zest and a hint of white pepper. "Many preparations lend themselves to the addition of Grains of Paradise. Especially steamed fish or light proteins such as poularde, suckling pig and other delicate items. "Do add freshly crushed grains of paradise at the very last minute of the preparation before you serve. "Never add grains of paradise at the beginning of the cooking process. Prolonged exposure to heat dissipates the subtle aromas and becomes very 'muddy' on the nose." 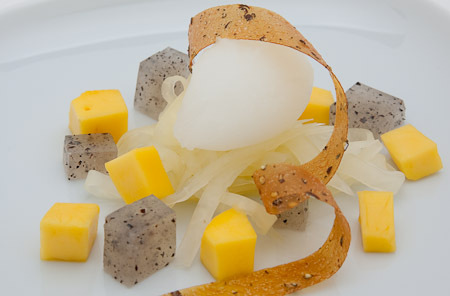 Read Chef Charlie Trotter's recipe for Shiso Sorbet with Mango and Grains of Paradise. Charlie Trotter is Chef and owner of one of the most highly acclaimed restaurants in the U.S., Charlie Trotter's, located in Chicago, IL. Since opening in 1987, Charlie Trotter's has collected an impressive list of awards; it was named best restaurant in the country by Wine Spectator and the James Beard Foundation, awarded five diamonds from AAA, five stars from Mobil Travel Guide, and Relais & Châteaux, just to name a few. Chef Trotter also owns Restaurant Charlie and Bar Charlie in Las Vegas, Trotter's To Go in Chicago, and C in Las Cabos Mexico. He has a successful television series, Kitchen Sessions with Charlie Trotter, on PBS that was awarded the Best National Television Cooking Show by the James Beard Foundation. Charlie Trotter is the author of 14 cookbooks and the subject of 3 management books focusing on the core philosophies that define his business. Chef Trotter is as passionate about philanthropy as he is about food. He founded the Culinary Education Foundation and works with over 2000 high school students each year and provides culinary scholarships for Illinois students interested in the culinary arts. I am thrilled to kick off TableFare's Spice Inspiration project with a contribution from Chef Charlie Trotter and such an exotic spice as grains of paradise. 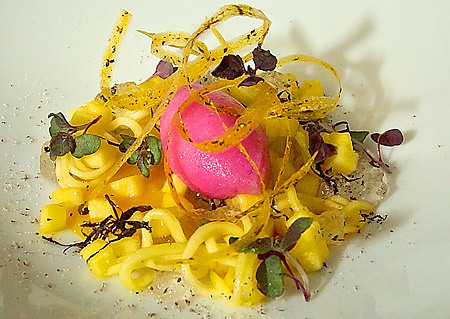 The Shiso Sorbet with Mango and Grains of Paradise is a recipe I hope you will try. In their restaurant this dish is served as a dessert course, but in a way that eases the diner from savory to sweet. Because it's light refreshing and not strongly sweetened, I find it works beautifully as an intermezzo, to serve between courses, and could even be served as a salad course. The level of elegance, textural and flavor interest that this recipe delivers is so beyond the minimal effort required to make it; it will truly impress your dinner guests. The recipe may look intimidating at first glance with so many components, but there isn't anything trickier than slicing, stirring, heating and cooling. The various components don't even need to be made at the same time so the prep can be broken up over of a couple of days. I worked through all of the prep in about an hour and then everything went in the refrigerator until the next day. I wasn't able to buy red shiso leaves, so I used green, which worked just fine, and wasn't able to buy green mango, but green papaya was a delicious substitute. This dish will give you a great introduction to grains of paradise, and hopefully you will be inspired to explore how this intriguing spice can accent other dishes you cook. Visit our Spice Library to learn more about grains of paradise. I have cooked from a number of Chef Trotter's books; they are beautiful and impart his passion for ingredients, careful technique, and purposeful composition that makes his food and restaurants so remarkable. The series focusing on single subjects, Vegetables , Seafood , Meat and Game , Desserts , and Raw (raw food recipes) inspire and challenge. The recipes are complex and adventurous and many can take the better part of a day to create, but they also illustrate how to develop complex flavors by focusing on the essence of an ingredient which is a skill that can carry over into everyday cooking. Charlie Trotter also knows when less is more; a great example is a recipe for broccoli soup that is as simple as juicing fresh broccoli, heating the juice, and adding a few simple seasonings before serving. It was sublime. The companion books to his TV series Kitchen Sessions are broader in scope utilizing a wide range of ingredients and recipes that range from simple to complex. With all of his books there is a comprehensive collection of base recipes included for numerous types of stocks, reductions, infused oils, flavored waters, and other staples that are used throughout the recipes in the books and can become pantry basics used to elevate any recipe. Home Cooking with Charlie Trotter is his most recent book that focuses on recipes easy enough to cook any day of the week, but with a level of sophistication not generally enjoyed in the middle of a hectic week. Fettuccini and Spinach in Saffron-Mussel Broth; Cantaloupe, Mango, and Asian Pear Salad with Key Lime-Vanilla Bean Vinaigrette; Apricot-Curry Chicken and Quinoa Salad are simple enough to be made on Tuesday night, but also elegant enough to serve to dinner guests over the weekend. There are a few fancy techniques thrown in for fun like a red wine emulsion that is whipped to a rosy foam and drizzled over an open-faced wild mushroom tart just before serving. There are also some interesting ingredients used like the Spring Pea Risotto with Spicy Herb Sauce that is made with togarashi, a Japanese spice blend.